This bracelet is entirely made by hand in parisian workshops by expert artisans. It is made of twisted threads, woven into a 1 micron 24k gold plated brass chain. ABDA Has chosen to bypass retailers in order to create and deliver products of higher quality. This bracelet is gold plated by one the most renowned parisian company in the field. The gold plating is exceptionally thick. While most common jewelry are gold plated at 0,2 micron, ABDA jewelry is plated 5 times thicker for total of 1 micron. All parts used to make this bracelet come from Paris. The chain and metal findings (chain, rings, closure) are gold plated by a french artisan. 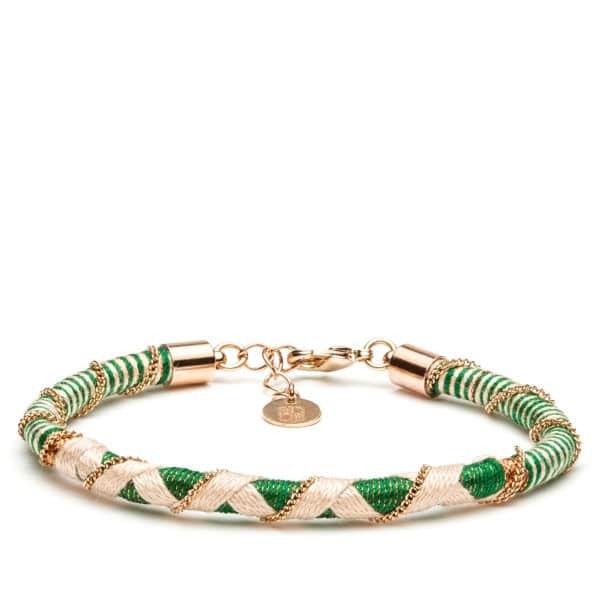 This bracelet is entirely woven and assembled by hand, in Paris, by expert artisans. The threads are made in France too. All metal parts are made of gold plated brass. The thickness of the plating is of 1 micron. The threads are of varying origin and composition but the majority are DMC pearl and Cébélia cotton thread. 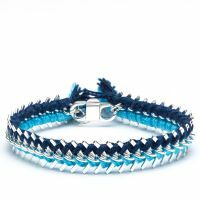 The threads fray very little, so this bracelet can be work under water although it will keep further if avoided.